Jay Fitzgerald has been the head coach of Pine Crest School since 1995. In the last 15+ years, Pine Crest School has added 194 High School All Americans to its ever growing list, along with 29 new State Titles and 15 new High School records. Winning records is exactly why Fitzgerald was recruited to Pine Crest School. Fitzgerald’s teams have won the USA Senior National Championships, Junior National Championships and the YMCA National Championships. 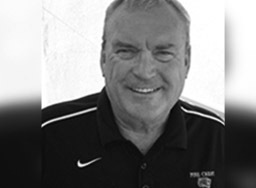 He has served as a USA National Team Coach several times since 1982, including the World Championships, Pan American Games, and the World University Games. Fitzgerald has coached 34 swimmers to major International teams, winning 17 Gold, 14 Silver, and 7 Bronze medals at these major competitions. Sixteen have been Olympians, winning 2 Olympic Gold and 2 Olympic Silver medals. Since arriving at Pine Crest School, Fitzgerald has continued to build on the programs rich and long tradition. The success of his swimmers have led to him winning “Coach of the Year” honors in 1995, 1996, 2000, 2001, 2003, 2005, 2006, 2007, 2009, 2010. In 2005, he was awarded the “ASCA Gold Award of Excellence” for 20 years of coaching a finalist to the USA Swimming National “A” finals. In 2006, Fitzgerald, was named the National Federation High School “South Sectional Coach of the Year” and was nominated for the National Federation High School “National Coach of the Year”.